Plumbing is a serious job and it requires a lot of concentration and focus. Still, like any other job, this also has some shortcuts that make things easier. As you are not certified plumber, you probably do not know these tips that we will show in this text. Of course, finding a good handyman to fix all your problems and issues is always a good option, but you can learn simple tips that could save you money but also time. These can be worth when you have a plumber who is the first time in your house and needs more time to determine where and how to start fixing your problem. The main valve is the most important thing as it controls the overall water flow. When you move to a new house, never forget to ask about the location of the main valve. Get familiar with the sewer so you could know the line in case you need to repair or clean the pipes. Of course, if you are not living in your own house, then you probably will not have access to the main valve. But if you have a house, always know the location of it as it can save you from the serious water damage. Be careful!! Be very careful when you want to drill your wall or floor, as one step could make a disaster. One small crack and you are facing a couple of thousand dollars of damage. And that is just a second of lost focus. 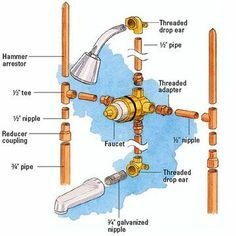 This connects to the previous tip as you will need to know the location of your pipe/draining system to avoid possible problems. Try to find a stud finder, which can help you to locate the pipes behind walls, or buy an endoscopic camera that you can squeeze through a wall. In any way, never puncture the pipes! This is one of the most common plumbing problems, as people flush a lot of items that should not to. Baby wipes, food, plastic bags or napkins can clog the system and cause pipe cracking and you know where it leads to. Flush only the dung and toilet paper, nothing else! Joints, connections and elbows should be tight instead of loose. However, do not over-tight them, as it can lead to broken bolts. This causes additional problems and you sure don’t want that. Every time you tight the connection, try to unscrew it with your hand and adjust just above the level that you can do it with your hand. Each leak can be fatal through the period of time. Once you detect the leakage, try to identify problem. 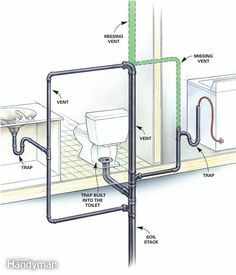 Sometimes is just enough to use plumber’s tape to make the connection tighter and more secure, to prevent further leaks. If the problem persists and you cannot locate the problem, then you should call a professional plumber.